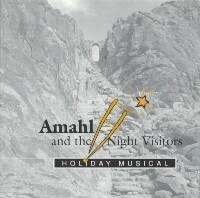 Amahl and the Night Visitors was my third on-stage theatrical performance, and was also my first opera. I auditioned for Amahl as a means to get involved in the community, as I had recently moved to Kalamazoo. The Kalamazoo Civic Theater is entirely volunteer-run. 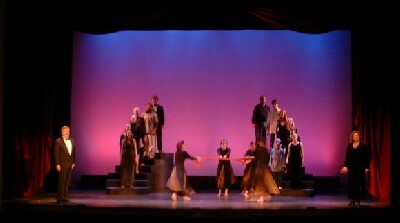 I had no great expectations for this show; I only wanted a part, and was very happy to be part of the shepherd's chorus. Since the opera itself runs for a very short duration, we also performed an accompanying piece, entitled "The Gift," written by the directors. I was very happy with my involvement with the Kalamazoo Civic, and look forward to performing in future shows. I met a lot of great people, and for the first time, felt like a part of the community. Of course, as with Anything Goes, Amahl was not without its interesting incident. The show ran 14 times during three weekends. Following the second weekend, I was diagnosed with mono. I had been quite sick for the performances that weekend, and in truth, barley had enough voice to perform. I ended up missing three weeks of work, but was able to finish the last weekend of the show, missing only the pick-up rehearsal, and the Thursday night performance. “Celebrate the Child” – closing of “The Gift,” which accompanied Amahl and the Night Visitors. Photo courtesy of Bob Griffin. Used with permission. 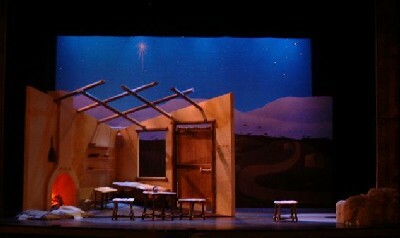 The set for Amahl and the Night Visitors. Photo courtesy of Bob Griffin. Used with permission. Curtain call for Amahl and the Night Visitors. Photo courtesy of Bob Griffin. Used with permission.